Claims Of Mass Graves Spur Calls For Inquiry In Ireland : The Two-Way After reports that children's bodies may be buried at an old church-run facility in Tuam, government officials met to discuss possible investigations into former homes for unwed mothers. 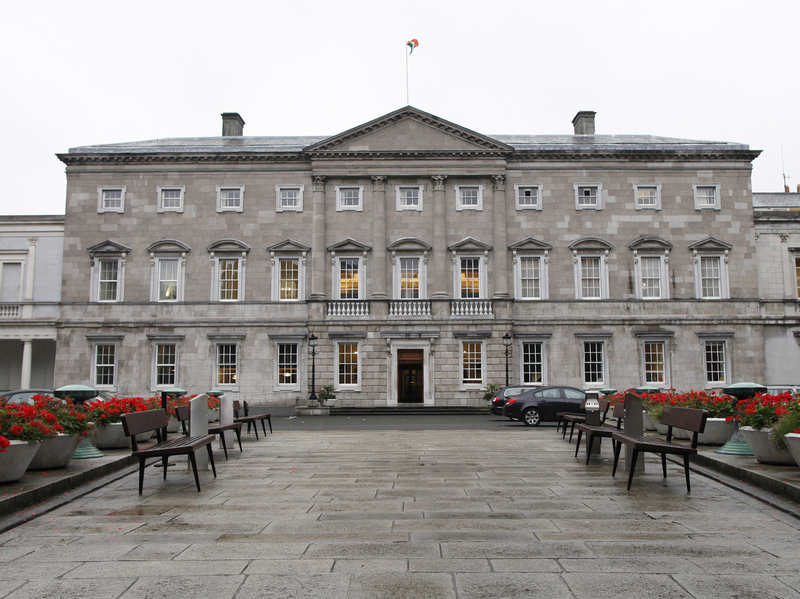 Leinster House is home to the upper house of the Irish parliament. Some members are calling for an investigation into children's deaths and burials at church-run homes. Earlier this week, we told you about allegations that children who died at a former home for unwed mothers in Tuam, Ireland, may have been buried in a mass grave. Irish lawmakers are now calling for a full investigation, RTÉ reports. At least one lawmaker has called for a formal apology from Prime Minister Enda Kenny. Homes for mothers and children were run by the Catholic Church but received state funding and some oversight. On Thursday, an interdepartmental group of government officials met to discuss possible investigations into Tuam and other homes for unwed mothers and their children. Minister for Children Charlie Flanagan, calling the reports about Tuam "deeply disturbing," says the group will report to the government on the best course of action. While some initial news reports indicated that up to 800 bodies were disposed of in a disused septic tank at the Tuam home, it is unclear how many — if any — sets of remains it may hold. The Archbishop of Tuam, Michael Neary, says he was "greatly shocked" to learn about a suspected mass grave, according to the BBC. He added that "this points to a time of great suffering and pain for the little ones and their mothers." He also says the diocese was not involved in running the home, which operated from the 1920s to the 1960s and was run by the Sisters of Bon Secours. The nuns met last week with a committee seeking to build a memorial at Tuam, RTÉ reports. Susan Lohan, co-founder of The Adoption Rights Alliance, which advocates for greater access to adoptions records, says a nationwide inquiry is necessary. "It's got to take in all of the mother and baby homes, all of which have mapped children's graveyards on site," she told RTÉ. There are at least three more suspected mass graves, located at former homes for unwed mothers in Bessborough, Castlepollard and Roscrea, according to RTÉ. The Sisters of the Sacred Heart of Jesus and Mary operated those now-defunct facilities. They told RTÉ they would participate in an independent inquiry into how children were buried at the homes, in order to establish the truth about a "very sad chapter in the history of Irish society."